Do you have any Modulus robots or equipment you don't need? Then please contact me at jehudahdesign@hotmail.com. Below is a list of robots and equipment I am searching for. - Any type of Modulus robot and accessories. - Service & Security robot with the head. - Service & Security robot with the original shoulder cover, or a loose shoulder cover, either black or gray. - Techno-Cake slices of any type, including blank ones. - Modulus robot parts of any type. - Circuit boards of any type. - An original Moddy torso display if it was ever produced. - Magazines containing articles about the Modulus robots. - Modulus related advertisement items. 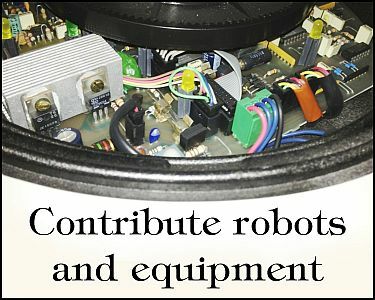 - Factory equipment used for the production of the robots. - The Modulus prototype, if still around and for sale.